Shimla : The BJP was set on Monday to wrest power in Himachal Pradesh from the Congress, winning 19 seats and leading in 25 in hard fought Assembly elections, although its two top leaders were worsted in the contest. Needing 35 seats to control the 68-member House, the Bharatiya Janata Party was on course to win 44 the Congress had bagged 11 seats and led in 10 others. An Independent and the CPI-M got one seat each. The Congress accepted defeat in Himachal Pradesh, which went to the polls on November 9. Among its prominent winners were outgoing Chief Minister Virbhadra Singh (Arki) and his son Vikramaditya Singh (Shimla Rural), who entered the Assembly for the first time. State BJP chief Satpal Satti was humiliated in Una by Satpal Singh Razda of Congress while the BJP's Chief Ministerial candidate Prem Kumar Dhumal lost in Sujanpur. Dhumal's confidants Ravinder Ravi, Gulab Singh and Randhir Sharma, all outgoing legislators, also lost. Congress cabinet ministers Sudhir Sharma, Thakur Singh and Prakash Chaudhary faced defeat. Chaudhary lost in Balh in Mandi district to BJP's Inder Singh Gandhi. 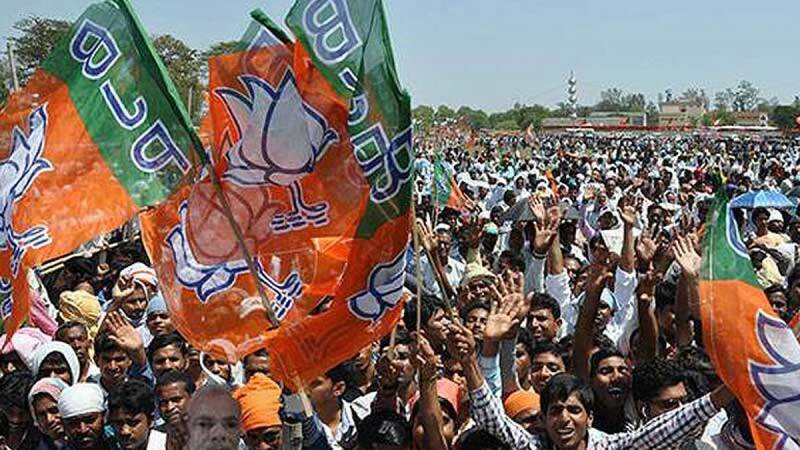 BJP's Ravindra Dhiman defeated Congress' outgoing legislator Yadvinder Goma in Jaisinghpur and Kishori Lal of the BJP overcame Bansi Lal of the Congress from Anni. BJP's Suresh Bhardwaj retained his Shimla seat, defeating Harbhajan Bhajji of the Congress. Anil Sharma, who resigned from the government and the ruling Congress and joined the BJP just before the polls along with his father and former Telecom Minister Sukh Ram, retained his Mandi seat. Independent Hoshiar Singh dealt a humiliating defeat to heavyweights Ravinder Ravi (BJP) and Viplove Thakur (Congress) in Dehra. Outgoing legislator Anirudh Singh of the Congress retained his Kasumpti seat by defeating BJP's Vijay Jyoti Sain. Both belong to the royal families. CPI-M's Rakesh Singha defeated both the BJP and Congress in Theog. BJP spokesperson Ganesh Dutt told IANS: "We have crossed the half-way mark. This clearly shows we are going to form the government in the state." A total of 337 candidates contested the election. A total of 37,83,580 people voted in the hill state -- a record 75.28 per cent polling. The Congress and the BJP contested in all the 68 constituencies. Most exit polls had predicted the BJP's return to power with an easy majority. The state has alternately elected Congress and BJP since 1985. In 2012, the Congress won 36 seats and the BJP 26. Independents bagged six seats.